Originally, the hotel was known as the "Royal Box of Athens," serving as a residence for royal guests to the palace of King Otto and Queen Amalia. Still today, the hotel's comfort is inherent in its furnishings and decor, as well as in its extraordinary level of service. Celebrated host to crown heads, chiefs of state and legends of the nineteenth and twentieth centuries, the Grande Bretagne is living history. A meticulous renovation prior to the Athens Olympic Games continues its celebrated 140 years of service by maintaining its Old World charm and elegance, while incorporating services, facilities and amenities of the 21st Century. It is truly a deluxe hotel of the future, with great respect for its illustrious past. All of the 320 guest rooms of the hotel have outstanding amenities, such as wall-to-wall marble bathrooms featuring a vanity counter, separate bathtub, and shower. With fog-resistant and lighted magnifying mirrors, every bathroom offers pure cotton bathrobes and slippers, salon style hairdryers, weight scales, and pampering Gilchrist & Soames bathroom amenities. The telephones have two IDD lines offering High Speed Internet Access. You'll also find individual bedside reading lights, cable television, and a fully stocked refreshment center. The smallest guest room is 27 sq. meters. Deluxe rooms measure 33 sq. meters and have city views; and the 44 sq. meter Junior Suites have additional amenities such as flat screen TV in the bathroom, plus DVD and CD player. The Junior Suites have a view toward the courtyard. Deluxe Suites are larger at 50 sq. meters, with courtyard or city views. Grande, Grande Deluxe and Executive Grande Suites are larger, have outstanding city views, extra amenities and more sumptuous decor. For guests who wish to spare no expense, the Presidential and Royal Suites are like no other, both in terms of amenities, furnishings and views, all of which are stunning and spectacular. The facilities of the Grande Bretagne include fine dining, as you would expect. There are four fantastic restaurants, each one luxuriously furnished, and each with its own special atmosphere, decor and menu. The service is impeccable, as it has always been, and the ambience is truly Grande Bretagne. Choose from the casual GB Corner, the GB Roof Garden with "the view," the Winter Garden, an atrium setting off the lobby, and during the summer months, you can dine on Greek cuisine at the rooftop Pool Bar. The hotel has three bars, plus the Atrium health bar near the spa, which serves light meals with the emphasis on fresh. Other facilities include two ballrooms, nine meeting rooms, a health club, and rooftop pool with sundeck. The indoor swimming pool and full-treatment Spa offer many beauty/health treatments, plus half-day or full-day retreats. Total pampering by the experts in incredible surroundings! 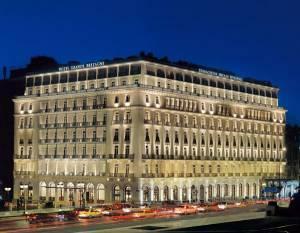 The hotel occupies a prominent position at Syntagma Square in the heart of the city.